119 Commonwealth is located on the north side of Commonwealth, between Clarendon and Dartmouth, with 117 Commonwealth to the east and 121 Commonwealth to the west. 119 Commonwealth was designed by Bradlee and Winslow, architects, and built in 1879-1880 by Standish & Woodbury, builders, as the home of Samuel Newell Brown and his wife Ruth (Ruthy) Coombs (Haskell) Brown. Ruthy Brown is shown as the owner on the original building permit application, dated October 1, 1879. Samuel Brown was a dealer in scales, doing business (in 1885-1890) as Fairbanks, Brown & Co. and selling the Fairbanks Scale. He also owned a number of hotels, including the New Ocean House in Swampscott. Ruthy Brown purchased the land for 119 Commonwealth on October 11, 1879, from Ellen M. (Atkins) Dobson, the wife of insurance agent Isaac Frank Dobson. The Dobsons lived at the Hotel Vendôme and previously had lived at 75 Marlborough. Ellen Dobson had purchased the land on September 20, 1871, from Henry C. Stephens, who had purchased it from the Commonwealth of Massachusetts on January 14, 1871. Click here for an index to the deeds for 119 Commonwealth. The original lot for 119 Commonwealth was 26 feet wide. When Charles Kirby built the house at 117 Commonwealth in 1871, he built the party walls entirely within the lot’s boundaries rather locating the walls so that the boundary lines ran down the middle of the wall, with six inches on the lot for 117 Commonwealth and six inches on the neighboring lot, as was usually the case. On November 25, 1879, Ruthy Brown purchased the western six inches under the party wall with 117 Commonwealth so that the Browns would own their half of the wall. 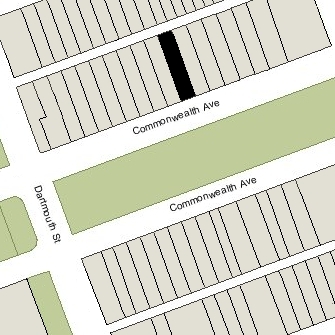 As a result, the lot at 119 Commonwealth was increased to 26 feet 6 inches in width. By the 1880-1881 winter season, Samuel and Ruthy Brown had made 119 Commonwealth their home. 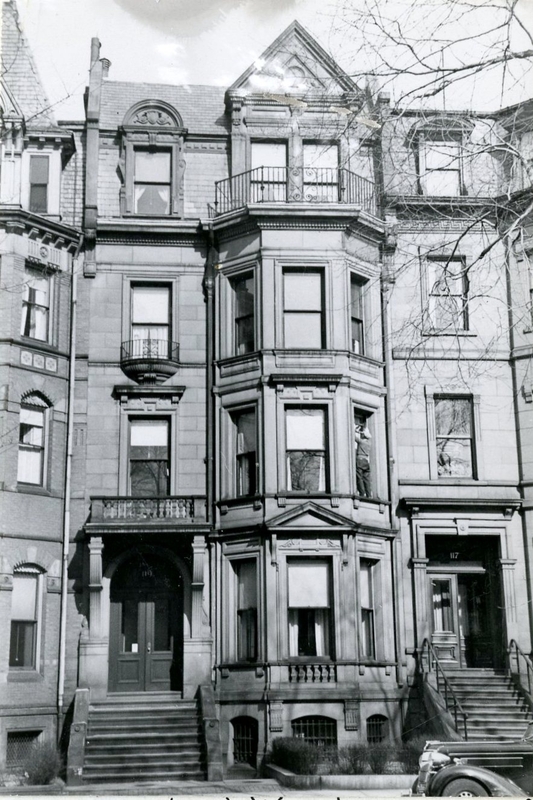 They previously had lived at 1 Huntington Avenue, on the northwest corner of Huntington and Dartmouth, where the Boston Public Library later would be built. Ruthy Brown’s unmarried sister, Grace Harriet Haskell, lived with them, first at 1 Huntington and then at 119 Commonwealth. Ruthy Brown died in March of 1909. Samuel Brown inherited 119 Commonwealth and continued to live there. 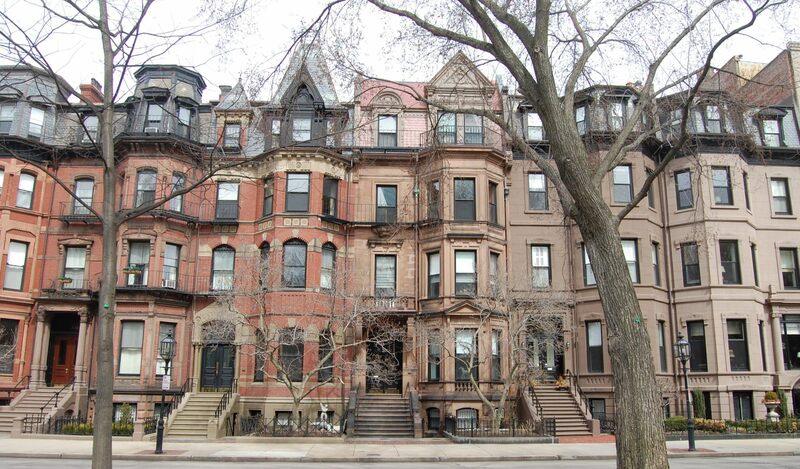 Grace Haskell lived there with him during the 1909-1910 winter season, but moved thereafter to Brookline. In October of 1910, Samuel Brown married again, to Charlotte Thompson (Ames) Bradford, the widow of Joel P. Bradford. On September 27, 1910, in anticipation of their marriage, Samuel Brown transferred 119 Commonwealth into her name. Samuel Brown died in July of 1912, at his New Ocean House Hotel. Charlotte Brown continued to live at 119 Commonwealth. On December 4, 1912, Charlotte Brown transferred 119 Commonwealth to Harold H. Brown, Samuel Brown’s son by his first marriage. She died in January of 1913. 119 Commonwealth was not listed in the 1914 Blue Book. On September 14, 1914, 119 Commonwealth was purchased by Mary Gertrude (Sutton) Russell, the wife of Richard Spofford Russell. They previously had lived at 491 Commonwealth. Richard Russell was president of William A. Russell and Brother, the investment banking firm that managed the Russell family’s manufacturing and mining businesses. The Russells also maintained a home, Oakland, in North Andover, where Richard Russell’s father, paper manufacturer and Congressman William Augustus Russell, had an estate, Lakeview Farm. Lakeview Farm subsequently became the site of the Brooks School, a preparatory boarding school founded by Rev. Endicott Peabody in 1926, and Richard and Mary Russell’s home became a dormitory for the school. Richard Russell served as treasurer of the school. On March 11, 1929, Mary Russell transferred 119 Commonwealth into Richard Russell’s name. The Russells continued to live at 119 Commonwealth in 1936. They subsequently divorced. Richard Russell moved to North Andover and married again, in March of 1937, to Katharine Allen; Mary Russell moved to Northampton and married again, in September of 1937, to Dudley P. Rogers. On November 6, 1936, 119 Commonwealth was acquired from Richard Russell by Anna C. Tuohy, an attorney. On September 4, 1937, 119 Commonwealth was acquired by Walter R. Scott, who reconveyed the property to Mrs. Susan Jane (Northridge) Taylor Jones, the widow of Thomas Brierley Taylor and the former wife of David R. Jones, who lived at 59 Commonwealth. On the same day, Susan Taylor Jones transferred the property to her daughter, Lucille F. (Taylor) Clarke, the widow of Lawrence Clarke, who operated it as a lodging house. She previously had lived with her mother at 59 Commonwealth. She also maintained a home in Marshfield. In 1940, Lucille Clarke remarried to Robert W. Norris. In November of 1943, she applied for permission to convert 119 Commonwealth from a single-family dwelling into a lodging house, legalizing its current use. She subsequently abandoned the permit, but the property continued to be operated as a lodging house. On May 6, 1944, 119 Commonwealth was acquired from Lucille Norris by her first cousin, Charles Leroy Northridge and his wife, Ann (Lundberg) Northridge. They previously had lived at 265 Clarendon. He was the son of Susan (Northridge) Taylor Jones’s brother, William H. Northridge. In June of 1944, Ann Northridge applied for permission add a fire escape at the rear of the house and convert it from a single-family dwelling into a lodging house. She subsequently abandoned the permit, but in April of 1946, she once again filed for (and subsequently received) permission to add a fire escape at the rear. In that application, she indicated that the building’s current and proposed use would be as a single-family dwelling. However, based on the Boston Lists of Residents, it appears that she nevertheless continued to operate it as a lodging house. On June 2, 1953, 119 Commonwealth was acquired from the Northridges by Edward J. Goodfellow and his wife, Mary Dorine (Jewers) Goodfellow. They lived there and continued to operate it as a lodging house. 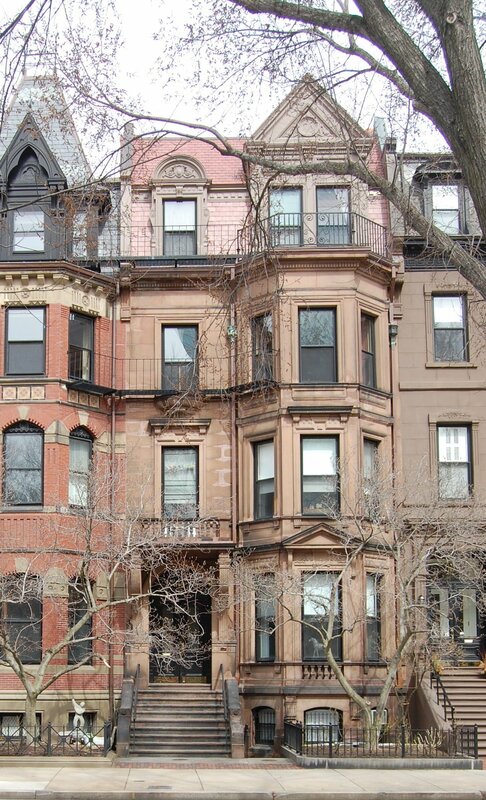 They previously had lived in an apartment at 247 Beacon. Edward Goodfellow was a salesman. In the early 1960s, he became the proprietor of the Colonial Lounge Bar at 981 Tremont in Roxbury. In December of 1969, the Goodfellows acquired 121 Commonwealth. The Goodfellows lived at 119 Commonwealth until the mid-1970s, when they moved to Florida. In August of 1976, John and Mary DeMusis acquired 121 Commonwealth from the Goodfellows. 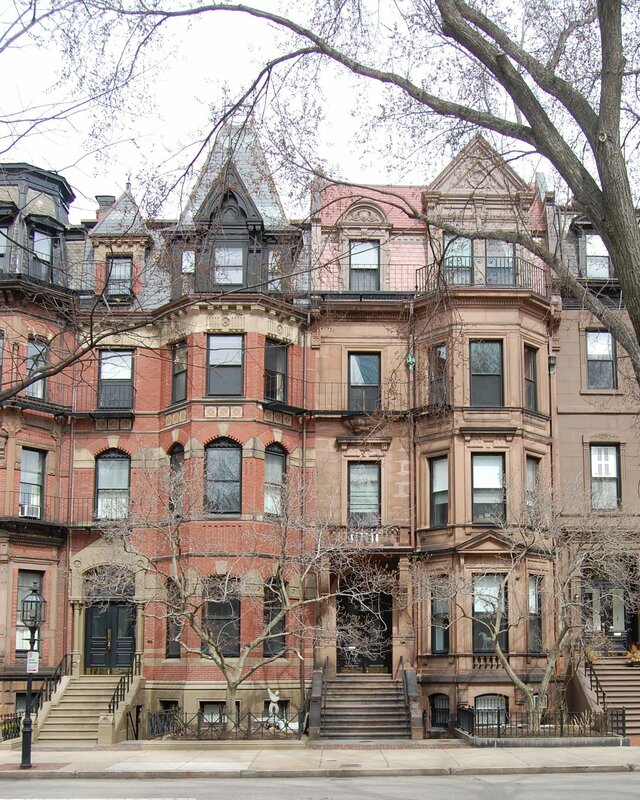 In July of 2000, John and Mary DeMusis filed for (and subsequently received) permission to change the occupancy of 119 Commonwealth to seven apartments and six lodgers. 119 Commonwealth remained an apartment building in 2016.